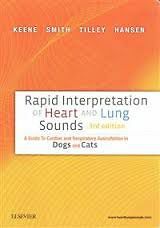 Learn to properly identify, interpret, and differentiate a wide variety of canine and feline heart and lung sounds withRapid Interpretation of Heart and Lung Sounds: A Guide to Cardiac and Respiratory Auscultation in Dogs and Cats, 3rd Edition. A brand new companion website features both simulated and actual clinical examples to help you master and evaluate common sounds like murmurs and arrhythmias. And with the helpful instructions in the text integrated with the heart and lung sounds, you will be well prepared to perform accurate heart and lung auscultation in dogs and cats.